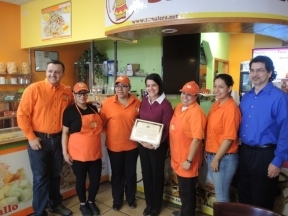 State Representative Silvana Tabares, D-Chicago, presented a “Good Neighbor” Business Award to Los Mangos Neveria y Fruteria in Little Village for their successful business practices and service last week. “These are the types of businesses we need to support in our communities,” Tabares said. “They have provided jobs through the expansion of their business and have given back by hosting activities for children. I’m very proud to present this well-deserved award to Los Mangos.” Tabares presented the award to the owners, Eladio Montoya and Jorge Angel, their families and staff. Since opening, Los Mangos has opened seven locations throughout the Chicagoland area. They serve homemade ice cream, snacks and fresh fruit daily. The “Good Neighbor” Business Award is presented to businesses that have shown dedication to improving their communities. State Rep. Silvana Tabares, center, presents her ‘Good Neighbor’ Business Award to owners and staff of Los Mangos Neveria y Fruteria in Little Village.